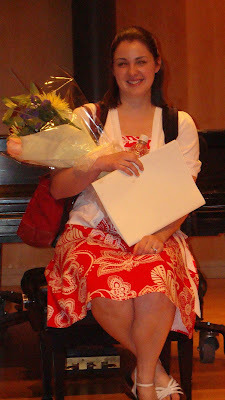 Here's Jen after the recital -- all done. 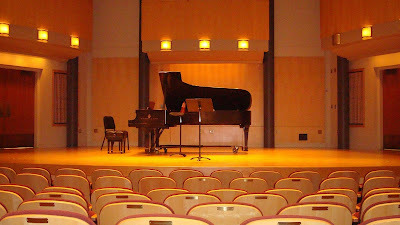 On Tuesday she will need to defend all of her recitals for the last three years. And, then, it's Dr. Jenny. She graduates over Memorial Day weekend and we will be going down for that. 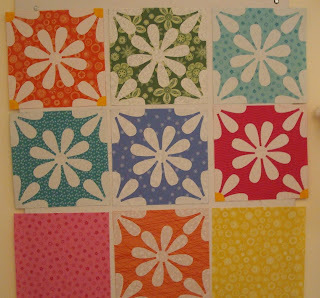 Jen is also a quilter so I thought I'd share what was on her design wall. She's been working on it for a while. It will be a baby quilt but there is no baby assigned to it. I like how bright and happy it looks. I should be able to get back to more piecing and general quilt stuff soon. Today I need to prepare for the next block of the month for my guild. I was planning on doing it on my new EQ6 but the blasted windows computer has gone hay wire. We are definitely not pleased. And, if you have EQ6 you know you only can install it 4 times. I've used 1 and the computer went crazy and removed it when it went through the restore cycle. It also removed the internet explorer and firefox so no internet access. But how screwy is this ... it still connects and gets email. That is a problem for another day. I'm off to get everything ready for guild tonight including making more of the Mar bom's that will be drawn tonight. I lost the 3 I already had. Where, oh where, did I put them... probably with Sharon's green fabric I can't find!